Pulsating at the heart of Chicago nightlife, FTW Chicago is an uncompromising reimagination of traditional arcades. 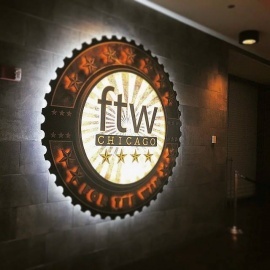 With an army of cutting edge games fleshing out its expansive footprint, FTW Chicago dominates the 2nd floor of the legendary Rivereast Center with its hybrid blend of immersive gaming and lavish nightlife appeal. Steam punk decor lends an underground speakeasy vibe to dazzling displays of light and sound, while seasoned bartenders pour ice-cold libations from our hand-picked selection of draft beers. From juicy gourmet burgers to crispy flatbread pizzas, mouthwatering aromas fill the air as our expert chefs churn out painstakingly crafted selections to delight the palate. For a few, FTW Chicago will be an unforgettable night out. For the rest, FTW Chicago will represent a new paradigm in nightlife innovation. Sprawling arcade bar featuring gastropub eats, cocktails & mini-golf in steampunk-themed digs.